Engineers on the Go exposes girls and boys to engineering through hands-on activities. The girls and boys will rotate through activities to learn what engineers do and the different types of engineering that exist. For more information, please contact the Office of Pre-collegiate Outreach Programs by email at pop@wpi.edu or by phone at 508-831-4900. *Notes: A student may attend this program or Introduce a Girl to Engineering, not both programs. There are no family opening or closing sessions. If WPI is closed due to inclement weather, this program will be canceled. There is no snow make-up day. A snack will be provided for each student, but if you choose to bring your own, it must be nut free. The Girls Robotics Team will offer girls in grades 3-5 an opportunity to explore and discover what robotics is all about. 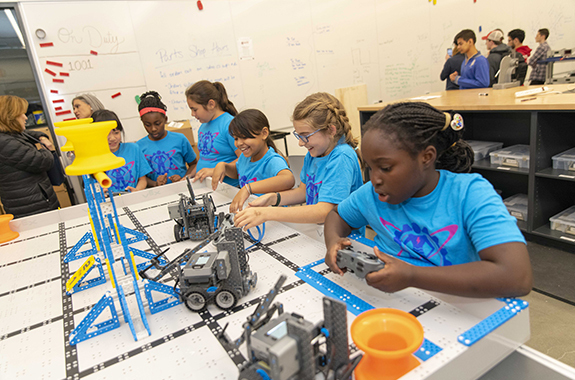 Girls will work together in teams to build and program robots and prepare to compete in a VEX IQ competition! This program will provide a safe space for the girls to succeed, and grow their confidence and abilities together. For more information, please contact the Office of Pre-collegiate Outreach Programs by email at pop@wpi.edu or by phone at 508-831-4900. *Notes: There are no parent opening or closing sessions. If WPI or Worcester Public Schools are canceled due to inclement weather, this program will also be canceled. There are no additional snow make-up days. A snack will be provided for each student, but if you choose to bring your own, it must be nut free. Introduce A Girl To Engineering Day exposes girls to engineering through hands-on activities. The girls will rotate through activities to learn what engineers do and the different types of engineering that exist. For more information, please contact the Office of Pre-collegiate Outreach Programs by email at pop@wpi.edu or by phone at 508-831-4900. *Notes: A student may attend this program or Engineers on the Go, not both programs. There are no family opening or closing sessions. If WPI is closed due to inclement weather, this program will also be canceled. There is no snow make-up day. A snack will be provided for each student, but if you choose to bring your own, it must be nut free. Is your student interested in science? Do they love math? Do they want to build a skyscraper or participate in a lab dissection? If they answers yes to any of these questions, or have a general interest in the STEM (Science, Technology, Engineering, and Mathematics) fields, then Tech Kids is an excellent after-school program for them! Tech Kids is a WPI outreach program that encourages children to pursue study and a career in the STEM fields by exposing them to many different fields of science and engineering along with a wealth of positive role models. During each session, WPI students facilitate a wide variety of hands-on activities that promote creativity, problem solving, and teamwork in middle school students. For more information, please contact the Office of Pre-collegiate Outreach Programs by email at pop@wpi.edu or by phone at 508-831-4900. Cost: $160 (fee is non-refundable). Need-based financial assistance is available. *Notes: There are no parent opening or closing sessions. If WPI or Worcester Public Schools are canceled due to inclement weather, this program will also be canceled. A snack will be provided for each participant, but if you choose to bring your own, it must be nut free.